The Aviary enclosure is the ultimate venue for exclusive entertaining and hospitality. With The Aviary as the central hub, wicker garden furniture, stylish wooden tables, chairs, umbrellas plus additional bars and coffee carts set the perfect scene for your event. Inside The Aviary itself, celebrity chefs or your caterers of choice can prepare dishes for guests and clients you aim to impress. The Aviary enclosure can be hired on an exclusive basis at sporting events and also operates as a walk up venue where guests can make reservations. A spectacular vantage point, the deck seats 20 people with the option to remove the stools to make standing room of 40. It blends refined elegance with modern technology and comforts. 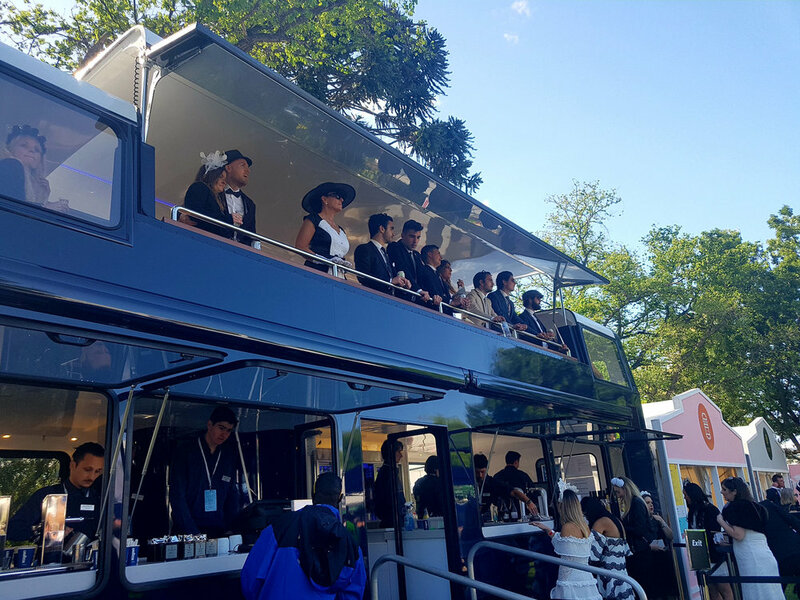 From unobstructed views of the track to celebrating above the crowd in style, the upper deck is sure to dazzle all. The Aviary has its own team of highly experienced Barmen, Baristas and Mixologists to oversee all aspects of the drink selection and preparation. From beer and champagnes to wines and cocktails, we can accomodate even the most discerning of drinkers. The Aviary has affiliations with renowned chefs and restaurants such as Movida, making it a dining experience to remember. You can also choose to use your preferred catering team (once qualified by Aviary Productions management), who we’ll work closely with to ensure a successful event. The Aviary can accommodate food services either via a mobile kitchen, purpose built food truck or utilise any sort of kitchen available and even catering services. The Aviary has its own sommelier, wine list, cocktail barmen and Front of House for all premium packages.